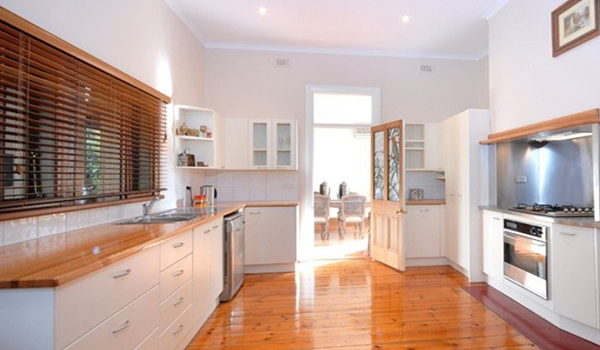 Our Buyer's Guide to Solid Timber Benchtops. Popular for their ability to be shaped & for their warmth and the character they project. 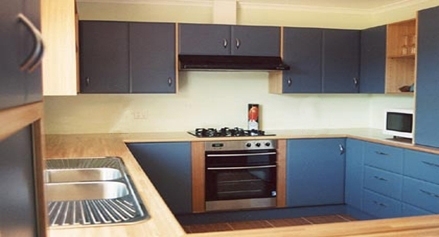 Solid Timber Benchtops are popular for their versatility; comfortably suiting Contemporary Kitchen styles, right through to more Traditional Kitchens. 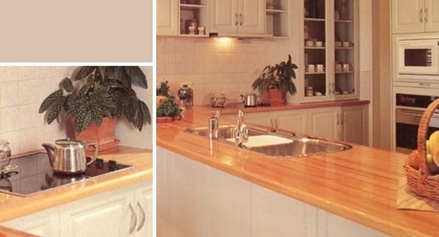 There is a limited selection of timber species which are suitable for Kitchen Benchtops, where these do also offer various types of grain pattern but a narrow range of natural warm colours. 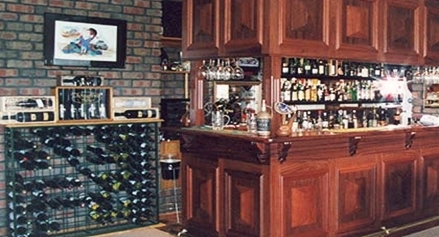 Solid timber Benchtops are popular for their ability to be shaped, as well as for the warmth and character they project; while providing a timeless appeal. At Compass Kitchens we believe that the keys to a quality timber top, (as with our timber doors), is to use the best Select Grade raw timber materials. We us the best grade of timbers, as well as adhesives and lacquers. 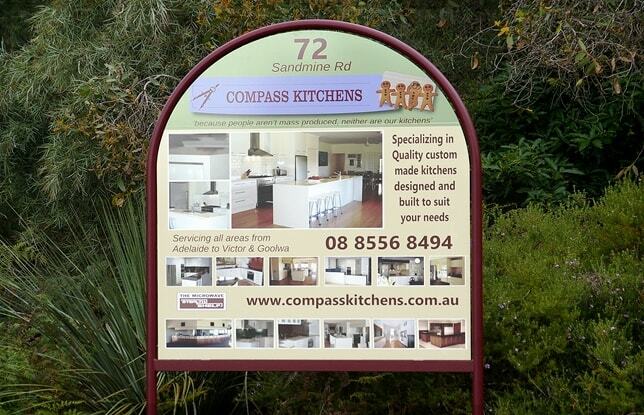 We employ the best construction methods along with timely skilled timber preparation. We then polish our timber tops while adhering to a professional Airless Coating System for a quality Two-Pack finish providing maximum protection and stability of the timber. We make our tops by gluing narrow timber strips together while alternating grain direction; like a laminated beam. This method makes our solid timber Benchtops stable, preventing these wide benches from cracking, bowing, opening or twisting; while still allowing for the natural movements of timber. 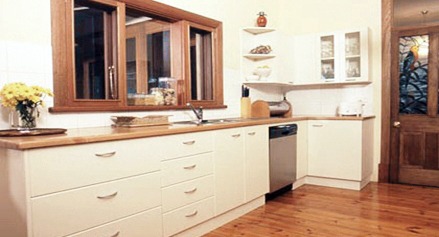 Timber Benchtops will last you a lifetime. As a general rule, one should reasonably expect around 10 years service from our polished Lacquer coatings, where they may then start to dull off. Depending on their condition at that time, one can contract us to come back to Cut-&-Buff the lacquer back to a high gloss or come back and re-polish these benchtops. 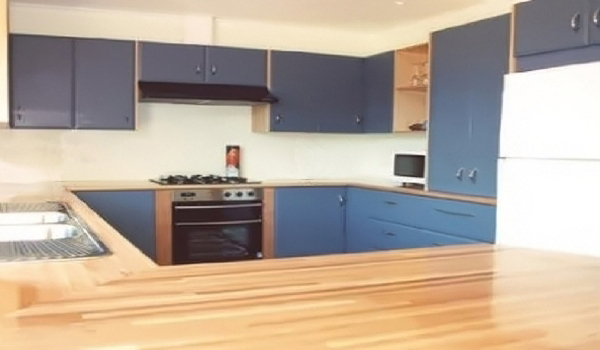 If the tops have been damaged, we can also strip them back, where with solid timber we can repair any knocks, dents and scratches; then sand and re-polish your tops, whereby returning your timber tops back to their original new condition.